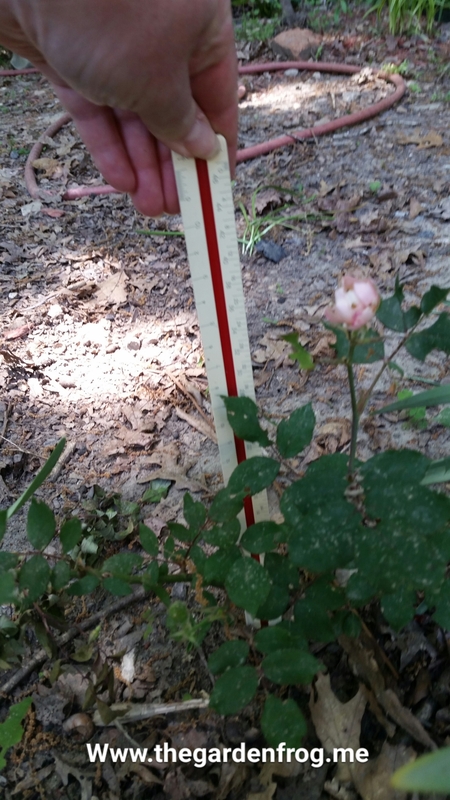 Today I am going to share a little story about a small rose bush that I never planted but grew anyway. 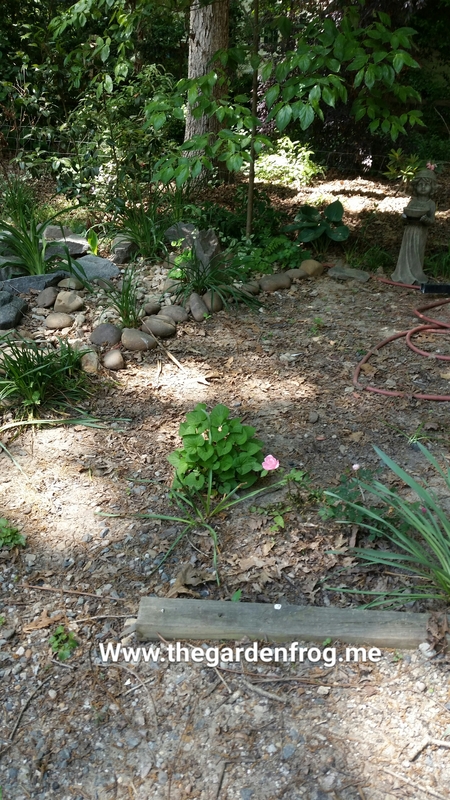 I discovered it about 4 years ago in the backyard in an area that had been hardened by years of drought and neglect. 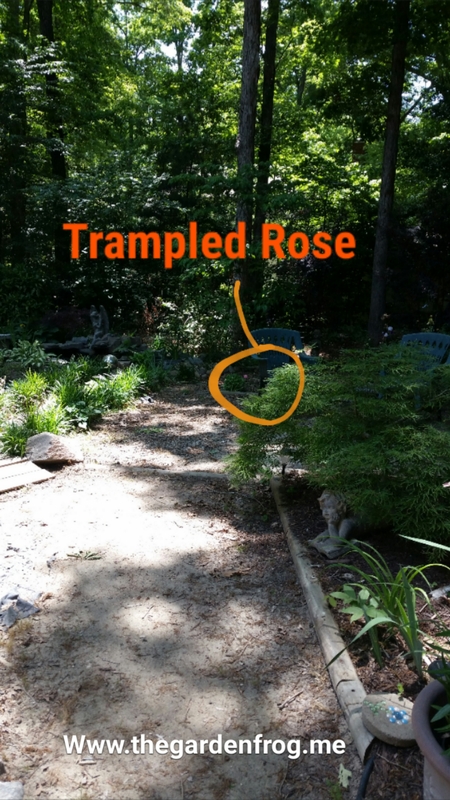 The trampled rose may have been planted by the previous owner before we purchased the house around 7 years ago but I never saw it. When we bought this house we removed approximately 25 loads of leaves and debris from the neglected backyard so the rose could have been buried under all the leaves. I think it was about 4 years when I first noticed the rose and since that time she has been trampled, stomped, and neglected. 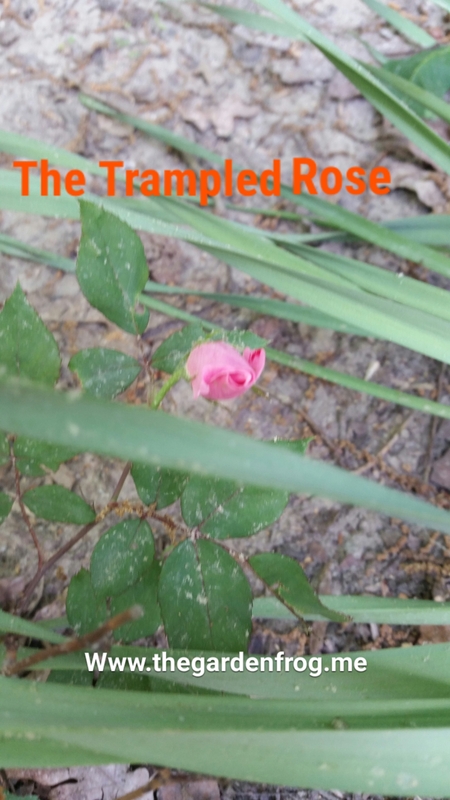 The trampled rose is not in a good spot (well at least not in my mind). It is in the worst spot a Rose could be- in the hard dry clay in part shade under the canopies of mighty Oaks. I even tried to dig it up one year but the ground was so hard I just said “the hell with it” and didn’t give a thought again until this spring when it started growing and looked as if it would be a real Rose. Then the inevitable happened. 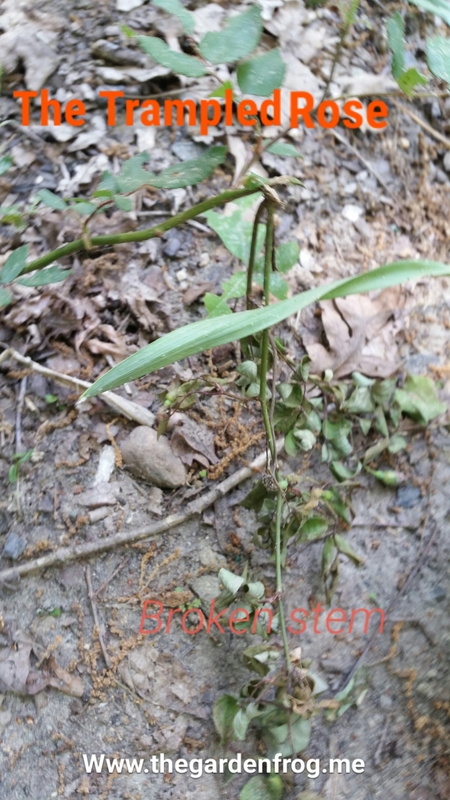 The little rose was trampled again and the new green 2′ stem was snapped off. I remember looking down and saying to the poor stomped Rose “I am so sorry you are in such a bad spot”. I love all things green and blooming. I love Iris and the beautiful purple Violets that grace the woodland floor. Do not get me wrong- roses are beautiful but I am just not into them. I have a few rescued roses in my yard under and next to the Oaks but is has taken 3 years to get blooms. Because roses require sun (which I have limited supply) and are prone to disease and pest problems, I have no real interest in growing them. 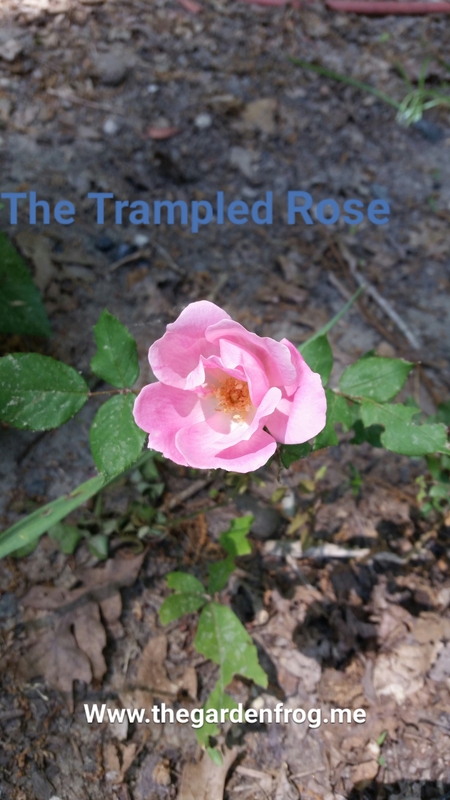 That’s okay because this morning I went out for my daily walk around the yard to see what is blooming and found that the “trampled Rose” had bloomed! It is less than a foot high. That’s it. I have no clue what kind or how it ever got there but walking up to the pretty pink bloom I realized something profound about my own life and my own being. At that moment I felt humbled by my own problems and self doubts and realized that life is about pushing past the self imposed limitations in our heads. Note: I was having a bad morning. Life does not stop just because we are trampled, broken, or lost. Life is energy and it is a great and powerful energy that connects us to each other and to nature. Nature has no bounds or limitations and this is seen when you find a tree growing in the side of a cliff or flower growing in the cracks of a sidewalk. If a plant knows no bounds, then why should I? 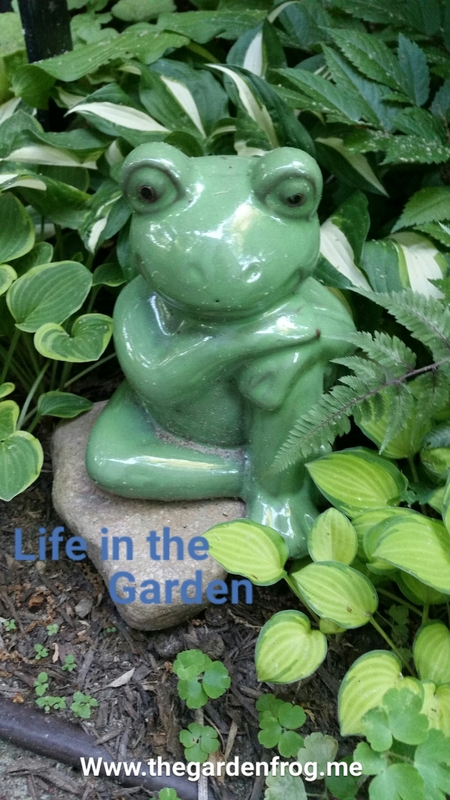 It may be peculiar for a gardener to write about such things but I am not your average gardener. I do not follow the rules and I am really bad about listening to others about how to do something. I am not an organic gardener and I am not even sure if I can qualify as a natural gardener because I sometimes have to use Roundup and sometimes I use my Mantis tiller to till up the ground. I do not use a whole lot of manmade chemicals but I also do not limit myself to the advice of the experts. So what has this to do with the trampled Rose? I am not sure there is a direct correlation but there is a connection. This connection or ‘moral’ of the story is for all of us to realize that no matter what happens in our lives and what our past was we can change or grow to be the person we are meant to be. Just as the trampled Rose has tried to emerge each year to show me her pretty little pink blooms, we need to continue to push through the self doubt and hard times that we feel are holding us back. My pretty little trampled Rose may have been put there for me to be reminded that I can be who I am meant to be – TODAY. That little Rose is determined to live. Very inspiring post! Sound like my kind of gardener. I try to go all natural, but sometimes I got to use chemicals )-; And I will alway use a tiller, in fact I need another. Lovely thoughts , wonderful read! I love this posts! 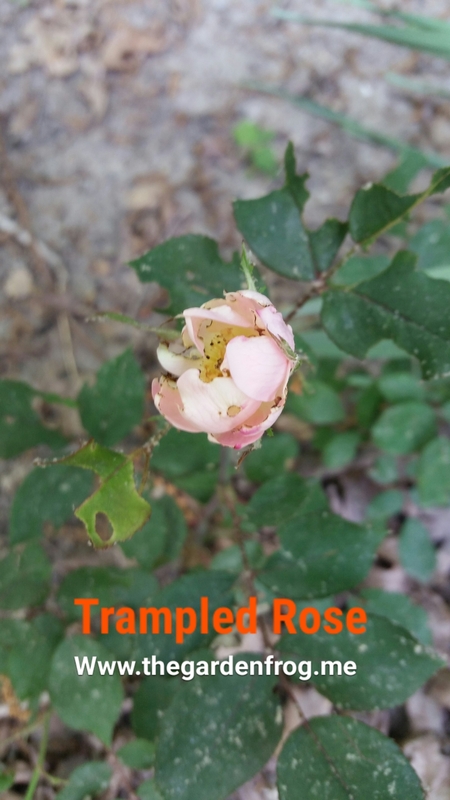 Make sure you start taking care of your trampled rose so it can grow into a beautiful bush!